"An interesting solution to the leftover Thanksgiving turkey dilemma. My 2 1/2 year old daughter helped me make it this year. I like to serve it with warm corn bread." In a large pot over medium heat, combine turkey, broth, canned tomatoes, green chiles, fresh tomatoes, onion, garlic, and lime juice. Season with cayenne, cumin, salt, and pepper. Bring to a boil, then reduce heat, and simmer 15 to 20 minutes. Stir in avocado and cilantro, and simmer 15 to 20 minutes, until slightly thickened. Spoon into serving bowls, and top with shredded cheese. 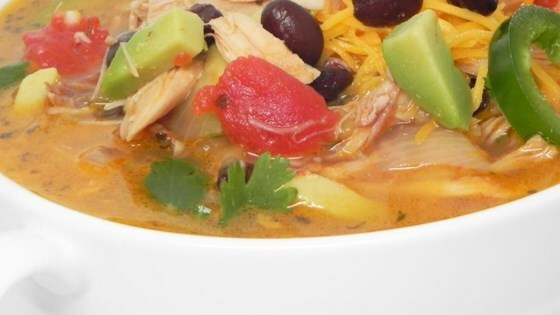 Turn leftover Thanksgiving turkey into deliciously different soup with some kick. I added a can of drained corn and used several tablespoons of minced fresh cilantro, and omitted the avocado. Children may find it a bit spicy for them. Quick & easy. Good. I added strips of 4 corn tortillas and cooked for an additional 20 minutes. Didn't have avocado.